Crown Princess Victoria and Prince Daniel attended an event at the Grand Hôtel Stockholm. The large costume jewelled brooch in her hair makes for a fun and informal tiara alternative. Lovely portrait of Prince Christian released for the occasion of his 11th birthday. It was a great counterpoint to news also from the Danish Court that Crown Prince Frederick fractured his neck in an incident involving a trampoline (something his mother had a quick response for). It appears he will make a full recovery. Prince Carlos and Princess Annemarie of Bourbon Parma hosted numerous events in Piacenza and Parma, Italy this weekend in celebration of their son’s christening. At a mass on Saturday held at Santa Maria della Steccata Basilica, Prince Carlos officially ‘showed’ little Prince Carlos Enrique to the people of Piacenza. For this event, Princess Annemarie topped a draped blue chiffon dress with a twisted white silk headpiece. For the christening yesterday, Princess Annemarie chose a dress and cocktail hat in a deeper shade of blue. The hat features a beret base trimmed with a large flat bow and swath of crin that encircles most of the design like a sort of flying brim. It’s a lovely colour on Annemarie but the near vertical placement was awkward- I would have much preferred to see this piece placed up and forward, perched down over her hairline on the right side of her forehead. 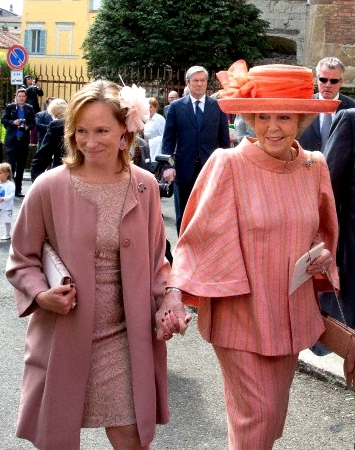 Queen Máxima used this occasion to debut a new hat with interesting history. During her June 10 visit to Urk, local milliner Hoedenhuis Kaptein gave it to her as a gift. While we don’t often see gifted items wore publicly, Queen Máxima surprised yesterday by wearing this hat. In pale grey straw, this design features an intended crown and slightly curved brim; it is trimmed with a white hat band and small grey bow at the side with trailing tails. I really like the strong shape of this piece on Máxima – we see so many repeated shapes on her and it’s wonderful to see something completely different- and think it could be a great design for her but I’m not sure its pairing with her delicate teal lace Dolce & Gabbana dress showed the hat to its best. I think this is an occasion where the individual pieces of this ensemble work better separately than they do together. Princess Viktoria was the only other member of the Bourbon Parma family in millinery of any description, a small pink fascinator floral pouf made from heat shaped petals. The scale feels too small for her and it’s far too twee for my liking, particularly in combination with her clunky heart shaped necklace. You can see a short video of the christening here. It is always lovely to see hats at this type of royal family event, even though I would have liked small tweaks on each of the ensembles we saw yesterday. Did any hats here stand out to you? And what do you think about Queen Máxima wearing a gifted piece? We saw so many hats worn by members in the House of Orange this year that we need to break this review into two parts! First, we’ll look at all of the hats and headpieces worn by the Dutch princesses. Please click on each photo to link to larger views and detailed information on each hat. Do any of these hats make your list for best of 2014? Are any of them on your list of least favourites? Stay tuned later today for a review of all the hats Queen Máxima wore this year. Prince Carlos and Princess Annemarie of Bourbon-Parma christened their younger daughter Princess Cecilia at the Cathedral of Piacenza in Northern Italy yesterday. For this special day, Princess Annemarie wore the most delicate cream silk rose fascinator trimmed with lace and fine net tulle. I thought she looked absolutely exquisite. Little Princess Cecelia wore a bonnet of what looks like antique Battenburg lace. I thought she looked very sweet and suspect that her older sister Luisa’s sour face below was because she was forced to attend the event without a hat. Prince Carlos’ sister, Princess Margarita of Bourbon-Parama, arrived with their aunt, Princess Beatrix of the Netherlands. Princess Margarita wore a pale pink pouf fascinator that coordinated with her coat and lace sheath. It was not the most exciting of headpieces but somehow, it worked with her ensemble. Princess Beatrix wore a very pretty melon-hued picture hat with upturned brim, ruched band around the crown and large side bow. The hat alone, I quite like. The hat with the sorbet-striped tunic and skirt however, was a little too…. orange. I suppose for a member of the House of Orange, this may not be an unwelcome criticism! Prince Carlos’ aunt, Princess Marie of Bourbon-Parama (pictured below right with Carlos’ brother Prince Jaime and sister-in-law Princess Victoria) was also in pink. Her hat defied gravity with a sharply angled brim and large side pouf bow. I loved how it coordinated with her chic bobbed haircut although I think the fur cuffs on her suit are horrid. Fur and pink jacquard together is never a good idea. Prince Carlos’ other aunt, Princess Cecilia of Bourbon-Parma (I suppose she must be who they named the baby after) wore a vibrant blue pleated straw and flowered headpiece. This headpiece left me scratching my own head as it did not seem to relate to her ornately patterned suit. I think the mix of swirls, scrolls, pleats and flowers was a little too much for one outfit- especially an outfit that looked like it was attending a Christmas soiree from the neck down and a garden party from the neck up. Despite these quirks, it was lovely to see members of the Bourbon-Parma family who we don’t see that often. It was also lovely to see this family so happy to christen their little daughter (a daughter who arrived early and spent many weeks in hospital). As we offer our best wishes to this family, I ask you, dear readers, which of the royal christening hats did you like best on this day?